In late 2018, thirty-four Indonesian and international social movements and non-government organizations came together to organize the “Peoples’ Global Conference against IMF-World Bank” (PGC) in Bali, Indonesia. The PGC provided a space for grassroots communities that have suffered from rights violations associated with the policies and programs of the World Bank and International Monitory Fund (IMF), and it served as the alternative peoples’ conference to the official IMF-World Bank meetings also taking place in Bali. In this month’s “Voices from the South”, Ivan Phell Enrile of the Asia Pacific Research Network (APRN), reflects on the key takeaways of an organizing space like the PGC. In particular, he looks at the importance of “inside / outside” strategies on advocacy; namely political organizing where activists/advocates are embedded both inside political structures and outside of them. Here he argues that “inside / outside” advocating is a necessary strategy to amplify the messages of peoples’ organizations and civil society in order to challenge the neoliberal development narrative of IMF and World Bank. He notes that there currently is a shrinking space for both inside and outside strategies for social movements, and that there is a need to protect these critical spaces. A version of this text, as well as other proceedings from the PGC, can be downloaded in the newly published book from APRN, “The 2018 Peoples’ Global Conference against IMF and World Bank in Bali, Indonesia”. 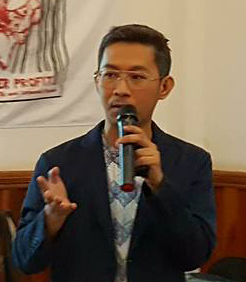 Ivan Phell Enrile, Asia Pacific Research Network and part of the International Coordinating Committee of the Peoples’ Global Conference Against IMF-World Bank. A common realization for peoples’ movements and civil society that engaged in both the official civil society space at the IMF-World Bank Annual Meetings in Bali (inside approach) and the Peoples’ Global Conference (outside approach) was the need to defend autonomous spaces for action and organizing for real transformative change. The inside/outside approach provided a necessary link between those advocating in the IMF-World Bank’s formal spaces with the movements focused on mobilizing and building resistance outside official spaces, but this space is shrinking. The inside/outside strategy is an approach to organizing and movement building that emphasizes learning from and coordination with all poles of opposition including movements, political blocs, and networks. By proposing a “both/and” (rather than an “either/or” attitude) towards mobilizing and advocacy engagement, the inside/outside strategy breaks free from the static binaries that divide peoples’ movements and CSOs and maximizes the strengths, and resources of all to strengthen peoples’ resistance, transform exploitative and oppressive relations, and achieve power. A number of PGC organizers participated in CSO forums sponsored by the IMF-World Bank. This includes among other CSOs APRN and “Reality of Aid” (RoA). Such avenues provide civil society opportunities to challenge institutional ideas and paradigms, network with like-minded CSOs and even sympathetic authorities, and promote the initiatives and alternative practices forged by movements beyond gilded halls. An example of a necessary inside advocacy was APRN’s co-organizing with Latin American Network on Debt, Development and Rights (Latindadd) at the IMF-WB Civil Society Policy Forum (CSPF) sessions. APRN’s presence was instrumental in promoting the network’s critique of public-private partnerships and the need to reclaim democratic public ownership of critical services and infrastructure. These perspectives are not otherwise heard in these spaces. Inside engagement requires risk and courage to be in or near the centers of power but remain loyal to the political project of transformative social change. It serves the objective of drawing solidarity for mass movements and taking up their vision. An effective inside engagement does not control or limit outside resistance but encourages its growth as the most effective leverage. The “outside” movement is where activists share information, devise strategy, broadcast their objectives, plan mass actions, and begin the strategic work of long-term organizing and movement building. The “outside actions” come in various forms such as alternative forums, mobilization, protests, and disruptions. Most recently, “prefigurative” socio-economic models and practices (in other words, actions striving to reflect the future society being sought by the group) have been becoming increasingly important form of outside actions. These projects attempt to come up with new social, economic, political, cultural, and ecological relationships and processes that defy dominant development narratives and rebuild communities exploited by reckless corporations backed by global governance institutions such as the IMF and World Bank. A PGC side event sponsored by Association for Women’s Rights in Development (AWID), Center for Women’s Resources (CWR), and SERUNI titled “Feminist Future Villages: A world without IMF-World Bank” utilized exercises to allow participants to imagine a new, collectively-created feminist geography of the future. They navigated this geography using the concept of villages. Themes were explored by different panelists, weaving together different threads to create visions of a feminist future. Such visions were elaborations of existing initiatives being done by women’s movements in different parts of the world; initiatives such as agroecology and collective cultivation of idle lands in Indonesia and the Philippines and feminist democracy in Rojava. 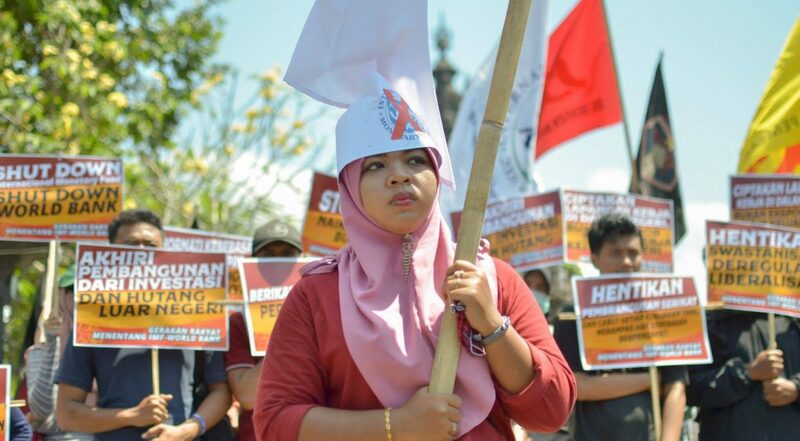 At the height of the repression against the PGC (see Karibu’s film on successes from 2018 for more information), APRN urged CSOs and the media to bring to the public’s attention the massive violations of fundamental freedoms and rights by the Indonesian government, with complicity of the Bank and Fund. APRN also gathered their support through sign-on statements to add public pressure to the Bank and Fund to honor their legal commitments to respect peoples’ rights to organize and mobilize. RoA on the other hand tapped its members to gather moral support for the lightning rally inside the Bali International Convention Center. Flexibility, creativity, and focus on political objectives are important especially in instances where unanticipated factors may hinder the achievements of identified targets and indicators. For example, while the PGC initially elaborated a 3-day program for simultaneous workshops, plenary discussions, solidarity nights, and mobilization, a major overhaul to the program had to be made in light of the government-sponsored brutality that descended on the conference. Despite the intimidation, surveillance, and banning, the PGC more than met its political objectives. The resiliency shown by the organizations amid harassment and physical violence raised the profile of the conference and generated lively public conversation not only on the problems raised by grassroots communities and sectors, but also on the solutions and their visions for the future. On a local level, the PGC contributed in gathering support for communities in Palu in Sulawesi and in Lombok who have been hit by powerful earthquakes and a tsunami, as well as highlighting the struggles of people in Bali against the Celukan Bawang coal power plant and the Benoa Bay reclamation project. 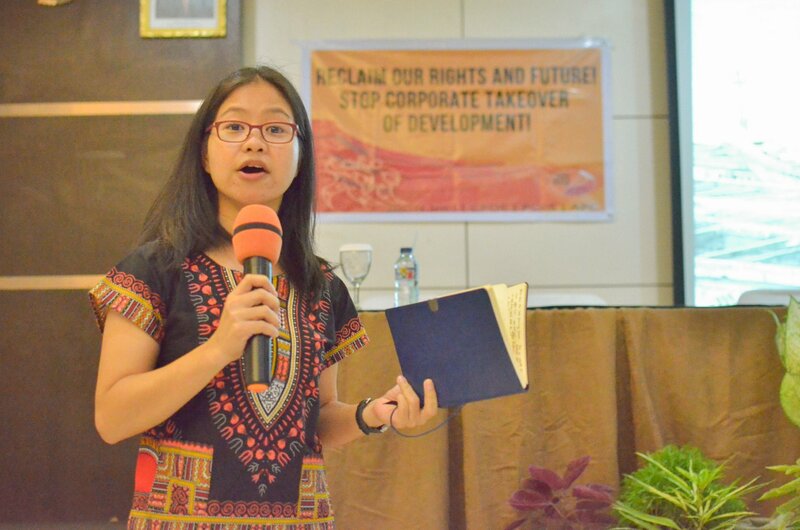 The opportunity to conduct groundwork in the areas mentioned, though the PGC, contributed in the establishment of organizations of women, students, and farmers that will hopefully sustain the struggles of communities against development aggression and international financial institutions. The year 2019 will be important for organizations in terms of transforming the gains of the conference to broaden peoples’ resistance to international financial institutions. Coordinated researches and days of actions for communities/sectors affected by IFI projects are already in the pipeline. Key conferences/meetings of IMF-World Bank, Asian Development Bank, and Asian Infrastructure Development Bank are some of the possible policy arenas for engagement, but primarily as opportunities for building solidarities with other movements and grassroots communities and mobilizing for transformative change. We must also continue to defend these shrinking spaces for social movements to advocate for those excluded from the development process, and for the rights of the victims of World Bank and IMF policies. Multilateral organizations and governments, in light of their human rights obligations are (at the very least) expected to respect these autonomous spaces and allow groups to conduct their initiatives without intimidation or fear of reprisals. Ivan Phell Enrile is the policy officer of Asia Pacific Research Network and part of the International Coordinating Committee of the Peoples’ Global Conference Against IMF-World Bank.